Sure to keep you warm on a cold winter day! In a Dutch oven on medium heat, fry bacon pieces until browned. Add onions and saute until caramelized, about 10-12 minutes. 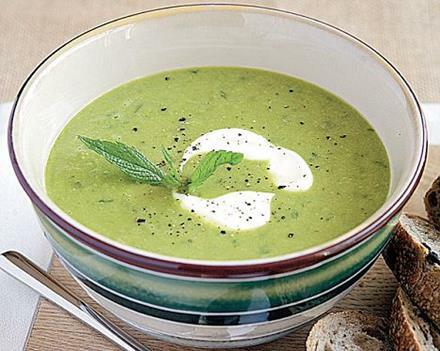 In a separate bowl combine stock with sprouted green pea flour and stir until smooth. Add mixture to soup pot, bring to a boil. Stir in salt and pepper. Lower heat to simmer and cook for 25-30 minutes. Add cooked peas and chopped mint to soup during last 10 minutes. Add 1/2 cup organic or raw cream for added richness. Serve with crackers or toasted pimento cheese sandwiches. Here's a great sprouted flour blend to have on hand for all your favorite baking recipes. In a large bowl combine all ingredients. Whisk together until thoroughly blended. Use a large spoon to bring the flour from the bottom of the bowl up to the top and whisk again. Repeat a few times to make sure the flours are evenly distributed throughout the entire mixture. Store in an airtight container in pantry up to 4 months. Refrigerate or freeze for longer freshness. Bring to room temperature before using. Lightly stir flour before measuring for recipes. Xanthan Gum and Guar Gum - May be used interchangeably. These gums give gluten-free doughs and batters more flexibility and stability, helping them to rise and then maintain their shape during and after baking. The addition of gum brings the texture of gluten-free baked goods much closer to the results achieved with wheat flour. What to do if your gluten-free baked goods are too dry or crumbly - If your baked goods are too dry or crumbly, add more butter or oil, not more milk or other liquid. 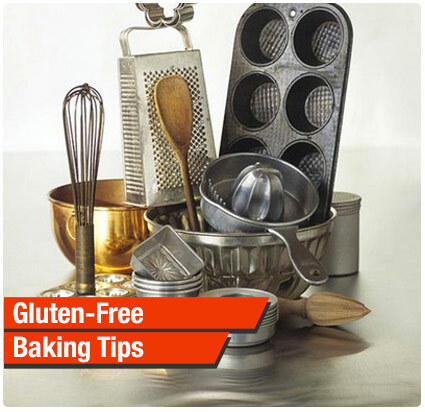 As a gluten-free item bakes, much of the liquid in the batter evaporates, leaving baked goods dry. Because gluten-free flour blends can absorb a lot of liquid, too much liquid can cause the baked goods to be dense and gummy. Too much liquid also can alter the structural support of the batter and may cause the dish to fall during or after baking. More butter or oil in the recipe will increase the amount of fat, which will not only moisten the batter but also help to bind the ingredients and add structural support. You'll also find that baked goods will be moister and stay fresh longer. 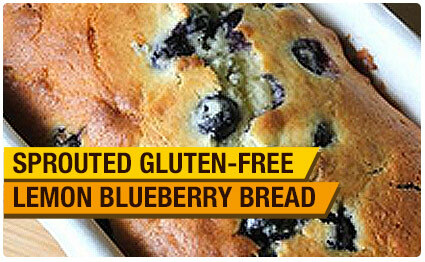 As seen in Gluten Free 2014 magazine. Small blueberries will stay suspended in batter best. Heat oven to 350 degrees. Generously butter a 4 1/2 x 8 1/2-inch loaf pan with butter. In a large bowl, whisk together the flour, baking powder, baking soda, xanthan gum, and salt until well combined. Make a well in the center and set aside. In a medium bowl, using a wire whisk, lightly beat the eggs. Add the sugar and whisk until smooth. Gradually whisk in the oil until well blended. Whisk in the lemon juice and zest. Pour the liquid mixture into the well in the flour mixture and stir until combined. Fold in the blueberries. Spoon the batter evenly into the greased loaf pan. Bake until golden brown and a wooden pick inserted in the center comes out clean, 50 to 60 minutes. Remove the pan from the oven and immediately remove the bread from the pan. Let loaf cool on a wire rack.